The Northeast Corridor region from Washington, D.C. to Boston makes up just 2% of the land area of the United States, yet is home to 17% of the population and 20% of U.S. jobs. If the Northeast Corridor region were its own country, it would have the fifth largest GDP in the world, just ahead of France, and a population of over 50 million people. From 2000 to 2010, major cities along the Northeast Corridor saw widespread population growth. Many cities, such as Philadelphia, Newark, and Bridgeport, saw their first residential growth since the 1950s, reversing decades of urban to suburban exodus. Compared to the United States average of under 100 persons per square mile, the cities and suburbs within the broader Northeast Corridor region average a density of almost 1,000 persons per square mile. 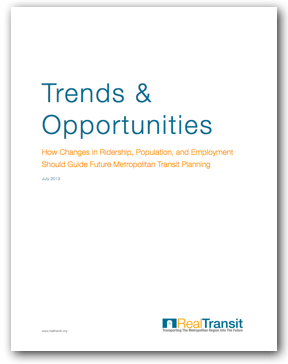 In terms of mobility, the Northeast Corridor region contains the most diverse transportation landscape in the nation. While automobile travel still dominates total commuter trips at 74%, alternative modes of transit are growing at a far faster pace than commuting by car. However, in the key urban cores of the Northeast Corridor region, the percentage of commuters traveling to work by mass transit is far higher. Overall, the Northeast Corridor region includes 75% of all daily commuter rail trips and 50% of all daily Amtrak trips. 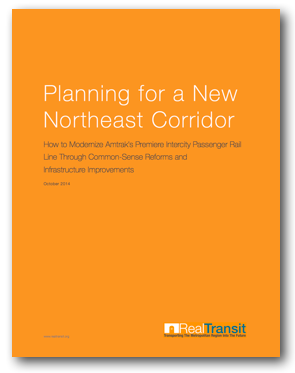 In the last ten years alone, the Northeast Corridor has added 33 million annual commuter trips, bringing its total to approximately 350 million annual trips. Between 2000 and 2011, the Northeast Corridor region added 708,000 mass transit commuters compared to just 671,000 car commuters over the same period of time. Part of this growth can be attributed to a rise in surface road congestion as well as the return of population growth to the Northeast Corridor region’s cities over the past several decades. Amtrak’s Acela Express provides direct intercity rail service to the majority of the metropolitan areas within the Northeast Corridor region. However, there are several key markets, such as Hartford, Albany, Worcester, Springfield, and Newburgh-Poughkeepsie, which do not have direct express service along the Northeast Corridor. These markets, which collectively account for a population of nearly four million people, rely on supplementary routes such as the Empire Corridor and Northeast Regional service. The northern section of the Northeast Corridor also travels through a relatively uninhabited portion of New England, which does not contain the sort of population density typical for the region as a whole. 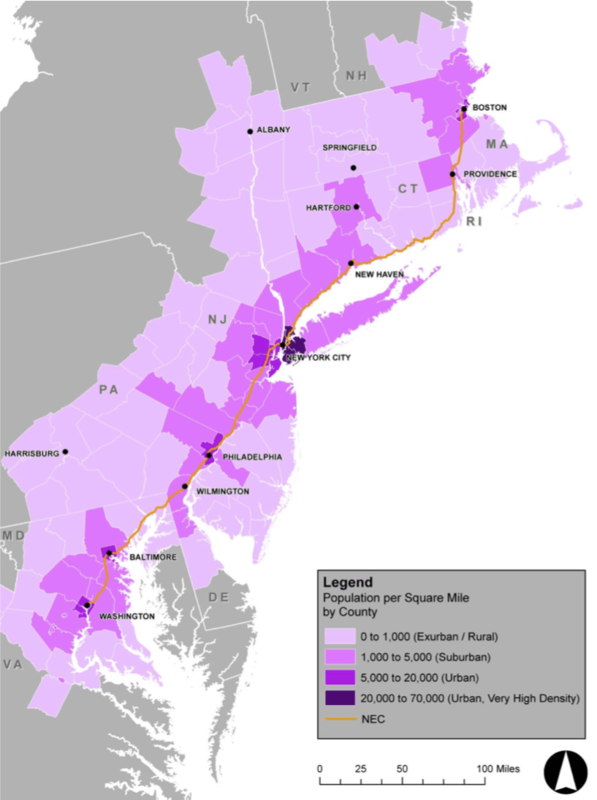 Middlesex and New London counties in eastern Connecticut and Kent and Washington counties in southern Rhode Island average just 477 residents per square mile in comparison to 8,200 residents per square mile within the counties along the Northeast Corridor. Airports within the Northeast Corridor region are among the most congested in the nation with 244 million annual passenger trips, which account for 30% of all U.S. air travelers. Over the past ten years, air traffic in the Northeast Corridor region has increased by nearly 20%. Within the New York metropolitan region, domestic volume at JFK Airport and international volume at Newark Airport have both increased by over 50% since 2000. Passenger and flight capacity, however, remains a growing problem for the region’s airports. Among the ten worst American airports in terms of on- time arrival rates, five of them are located in the Northeast Corridor region, and these airports average an on-time performance of just 77%. Within the New York metropolitan region, La Guardia Airport, Newark Airport, JFK Airport, and Philadelphia Airport (which operates in New York’s airspace) account for nearly half of all United States flight delays. Between the eight regional airports along the Northeast Corridor, passengers depart an average of 24 minutes behind schedule, which results in an estimated $2.5 billion in annual costs associated with delay. 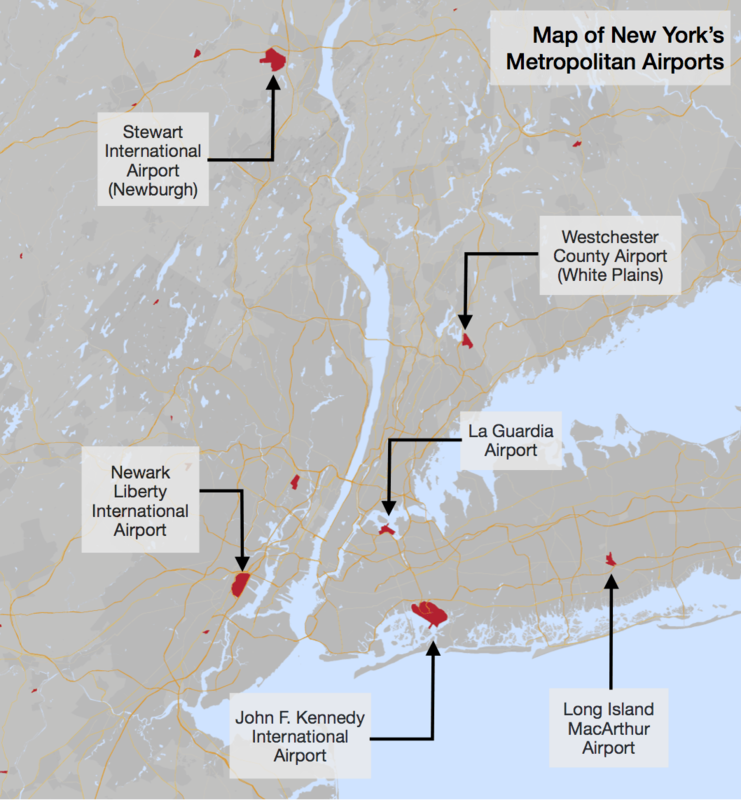 To that end, the Federal Aviation Administration, in their most recent report on the capacity needs of the nation’s airports, identified New York as the sole metropolitan area currently needing additional capacity today. In order to help address the historical congestion and expansion limitations of the New York metropolitan region’s airports, the Port Authority of New York and New Jersey took over operations at Stewart International Airport in 2007. 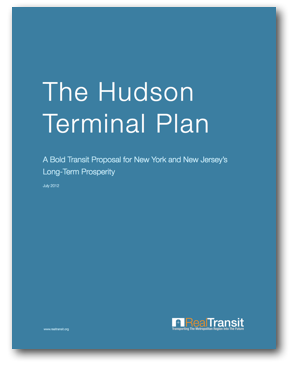 However, without any mass transit connections, and considering the long-distance travel required from the New York urban core to Newburgh, Stewart Airport remains underutilized. Where the metropolitan area’s three major airports had nearly 55 million passenger boardings in 2012 with operating profits of over $400 million, Stewart Airport had approximately 600,000 passenger boardings in 2012 with an operating loss of over $5 million. Further, Stewart Airport’s facilities, runways, and highway connections are not built to absorb the significant numbers of metropolitan air travelers needed to effectively ease congestion in the region. Nevertheless, Stewart Airport current sits on more land (both developed and undeveloped) than JFK Airport and La Guardia Airport combined, which allows for significant expansion opportunities in the future. 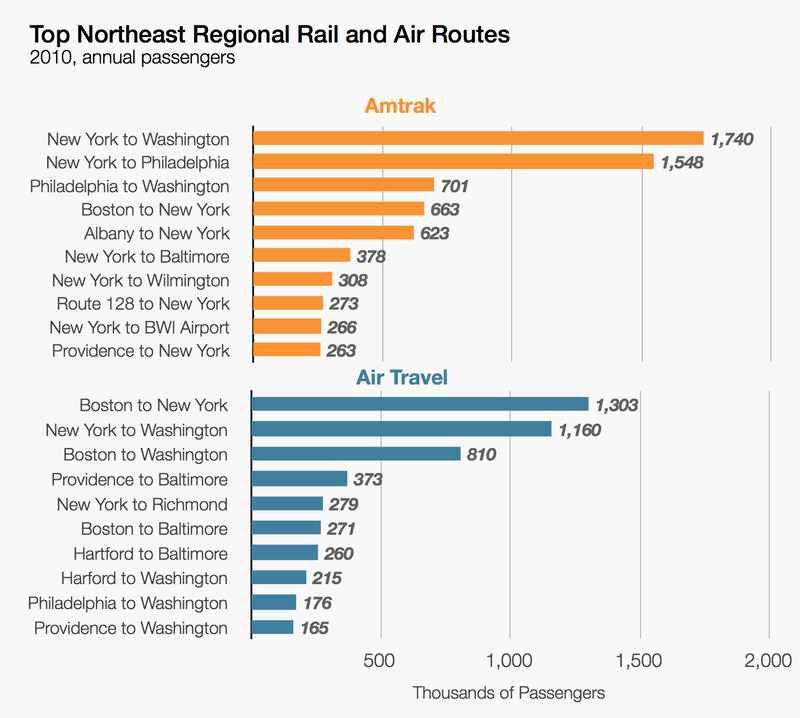 Despite the congestion within the region’s airports, air travel remains the preferred mode of transit for a number of routes along the Northeast Corridor due to faster trip times and lower ticket prices.